The Perfect Guide to Self-Studying Japanese: Part I | Suki deshou? Who am I kidding right? If such a thing existed, you wouldn’t be reading this blog, and I wouldn’t be writing it. But still, I figured I’d contribute my knowledge about self-studying Japanese (like many other blogs out there have already done) and possibly help you discover new ways to learn this ever-so difficult language. Romaji: Literally “Roman letters”, aka Western alphabet system (and completely useless, unless you want to write out a word for phonetic purposes, but then again you have katakana to do that. Romanization of Japanese words is difficult, and there are several ways of doing it e.g. : “suki deshou” vs “suki deshoo” vs “suki deshō”). 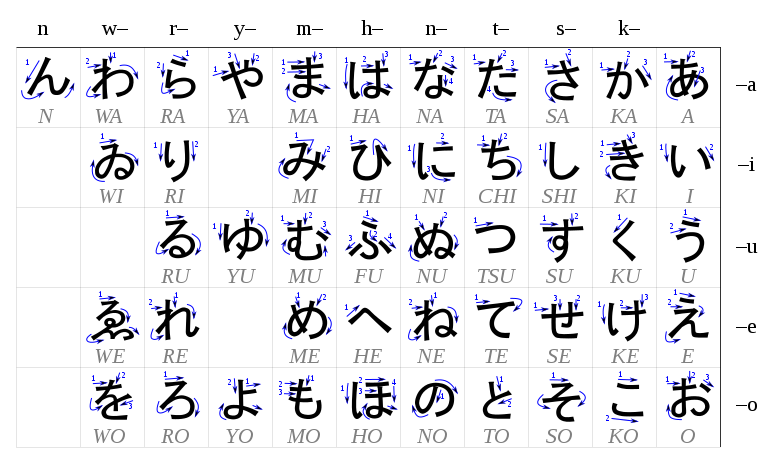 ひらがな (hiragana): Japanese syllabary, used for words of Japanese origin, verb suffixes, particles, etc. 漢字 (kanji): Chinese characters, used for words of Chinese and Japanese origin. While learning kanji is extremely important, we’ll leave that for another time. As soon as the two syllabaries are mastered, then a slow introduction to kanji can be made. When the vowels and consonants are combined, you get a grand total of 45 syllables (minus 5 that are no longer in use in modern Japanese). Each syllable can either be nasalized or non-nasalized with a simple symbol (゛) that looks just like quotation marks above the syllable. You can only nasalize K-S-T & H, which respectively become G-Z-D & B/P. To create the “p” sound, you must add a (゜) to the syllable. Now of course, your work doesn’t stop here. You still need to learn the exact same syllables, only written differently (with katakana). 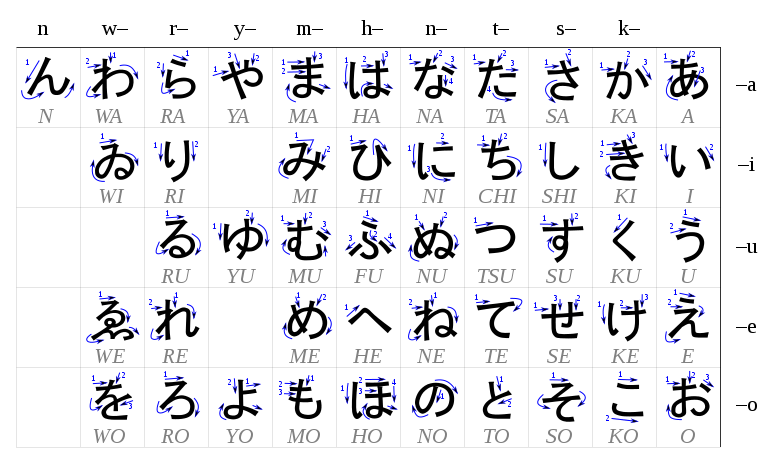 You will find some similarities between hiragana and katakana; this is because the latter is derived form the first, which in turn is derived form kanji. While I won’t go into details here of the relationship between all three systems (because it would take forever to write, and I have no interest in re-writing what somebody else has already covered in textbooks and/or blogs) the connection is evident and I encourage you to study it in depth in order to truly understand and appreciate the beauty of Japanese writing. Simply memorizing these letters will not do the trick, as you will soon forget them lest you practice regularly. Once you’ve mastered both syllabaries, you can come back here for more tips and tricks to help you along your journey! Good luck, see you soon! 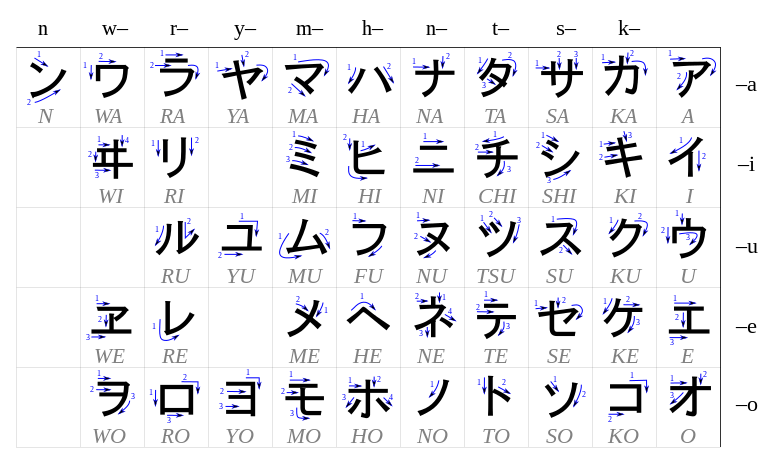 Tags: alphabet system, hiragana, Japan, Japanese, japanese syllabary, katakana, Language, self-study. Bookmark the permalink. You’re welcome! I’m glad this helped you at least a little bit 🙂 Making a how-to guide isn’t the simplest thing in the world but I’ll try my best to give some advice about what to learn and when to do it 🙂 I’ll probably put up a timetable next time to help coordinate your studying periods and objectives. Thanks much for taking the time to craft such a concise, well thought out post. Romaji can be a real crutch and as far as I’m concerned, it stands in the way of making good progress. I encourage beginners to just dive in and give yourself a chance to grab hold of the basics, and you’ll be pleasantly surprised by how quickly you get the hang of it! This is a really fun, well rounded blog, I’ll be back for sure! Thank you for reading and commenting, I’m glad you enjoyed it 🙂 Trying to teach via blog postings isn’t the easiest thing to do but, as a Japanese learner myself, I think I can offer some tips that will hit home with beginners. I agree with you, immersion is the best way, and it really does force the learner to quickly pick up on things. I was curious if you ever believed of altering the page layout of one’s website? Its very nicely written; I adore what youve received to say. But maybe you can a bit much more within the way of content material so people could connect with it much better. Youve received an awful lot of text for only having one or two images. Perhaps you can space it out better? Thank you for your suggestions, perhaps you could tell me what kind of layout you think would be helpful? I’m open to changing things around if I know it will help the readers.